Presque Isle Bay is the oldest harbor on the Great Lakes. It is formed as Presque Isle peninsula arches north and east into Lake Erie, forming the Bay. Presque Isle State Park forms the northern shore of the Bay. Most of the southern shore of the Bay is bordered by the City of Erie. The western end of the Bay borders Millcreek Township. There are numerous marinas (mostly private) along the south shore of the Bay. The Port of Erie Marine Terminal, Dobbin's Landing, the Maritime Museum and the home of the Flagship Niagara are all located along the southern shore of the Bay. The Bay is about 4.6 miles in length, and about 1.8 miles across at its widest point. The Bay has an average depth of about 20 feet. Use NOAA Chart 14835 (Erie Harbor) for a detailed map of the Bay. The western end or "head" of the Bay is closed, and provides access to Presque Isle State Park via Peninsula Drive (State Route 832). The Bay is connected to Lake Erie on its eastern edge via "the channel", which is a dredged, concrete walled 0.6 mile channel designed to accommodate large freighters entering Presque Isle Bay and the Port of Erie. The channel is about 25 feet deep. The "North Pier" forms the north side of the channel, and is accessed from the tip of Presque Isle State Park near Beach 11. The U.S. Coast Guard Station is located along the western edge of the North Pier. The South Pier forms the south side of the channel, and is accessed off the Bayfront Parkway, near Lampe Marina. Fishing in the channel is only from the North or South Pier. Because the walls of the channel are high, this is primarily still fishing, although there is some casting for bass. Since Presque Isle State Park opens at sun up and closes at sun down, there is no fishing on the North Pier at night. The South Pier is open 24 hours a day. The area straight in from the channel and south between the Parade Street Dock and the the Sassafras Street Dock (known, from east to west, as the Harbor Basin, the Erie Turning Basin and the Harbor Turning Basin), is also dredged to a depth of about 25 feet. The areas along the northern edge of the Bay, bordering Presque Isle State Park, drop off gradually and contain some shoals and rocks. From the Vista Boat Launch to the area just west of the Presque Isle State Park Administration Building, several hundred feet from shore, is an area known as the "trench." This trench was formed in the 1960s when sand was taken out of the Bay and pumped to the beaches on the lake side of the Peninsula. It reaches a depth of 23 feet at a point southwest from the Lily Pond. Just inside the channel, to the north, and just north of the Coast Guard Station, is Horseshoe Pond. Houseboats float in Horseshoe Pond throughout the year. Horseshoe Pond is about 6 feet deep. Misery Bay is located just west of Horseshoe Pond and north of Perry's Monument. It is named for the hardship suffered by the sailors under the command of Commodore Oliver Hazard Perry during the winter of 1813-14 immediately following the Battle of Lake Erie. Misery Bay is a popular fishing spot. The walls along the monument side are concrete. It is about 9 feet deep. The "lagoons" begin at Misery Bay, and extend west into Presque Isle State Park. The lagoons include three ponds: the Grave Yard Pond to the east, the Big Pond in the middle, and the Long Pond to the west. The Presque Isle Canoe and Boat Rental is located in the Grave Yard Pond just west of Misery Bay. The western end of the lagoons empties into Marina Lake, where the Presque Isle Marina is located. Only electric powered and unpowered boats (i.e., row boats and canoes) are permitted in the lagoons. The lagoons area is an interesting and tranquil place. Marina Lake is also located inside Presque Isle Bay. The Presque Isle Marina is located inside this small lake. Marina Lake has its own channel into the Bay, which is about 10 feet deep. The channel to Marina Lake is visible from Dobbin's Landing at the foot of State Street in the City of Erie. This channel also has range markers to guide you into the marina. The S.O.N.S. of Lake Erie have sunk about 180 artificial fish habitat structures ("cribs") in various locations in the Bay. These cribs, of three different configurations, are designed both to provide shelter for small fish, and to provide cover for sport fish. Cribs have been installed in the northeast corner of Misery Bay, about one-quarter of a mile out west from the west wall of the Marina Lake channel, inside Marina Lake, and behind the park Administration building about 150 feet from shore. More cribs are planned for the future. The Bay is generally calm and accommodating to most watercraft. Whitecaps can be found on the Bay in heavy winds. With a strong west wind, waves in the main Bay can exceed three feet. However, Misery Bay, Horseshoe Pond, Marina Lake and the lagoons are sheltered and often remain relatively calm even when the winds are strong. 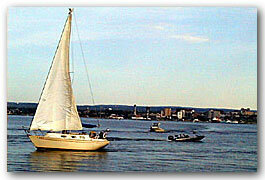 The Bay is popular for all types of pleasure watercraft, including sailboats, speed boats and jet skis. During summer weekends, the Bay can be crowded with boats. The channel can also be very busy, with a constant parade of boats going to and from the lake. The waters just inside and outside the channel can become very choppy from all the boat traffic. A slow minimum height swell speed must be observed with in 500 feet of the Presque Isle State Park shoreline. Since the Bay is generally calm or has only small waves, practically any boat can be taken on at least some part of the Bay. Traditional bass boats can be used on the Bay if the waves are not significant. Car top boats can be used in Horseshoe Pond, Misery Bay, and even in the main Bay if the conditions are calm (and the boat traffic is not too severe). There is no horsepower limit anywhere on the Bay except in the lagoons. In the lagoons, only electric powered boats and unpowered boats are permitted. Very small boats are common in the head of the Bay, in Horseshoe Pond and in Misery Bay. Boat traffic is the most common enemy of small boats in the main Bay. Fourteen to eighteen foot boats often troll along the shorelines. Large lake boats must be careful in the head of the Bay because it is shallow and weedy. For details on boat launches in the Bay, please see the Marinas page. Shore fishing in the Bay is popular. Fishing along the north shore of the Bay from Presque Isle State Park is permitted almost the entire length of the park. Many areas along the shores of the park are suitable for wading. Popular spots for fishing from the shores of the park include on each side of the channel to Marina Lake, below the bridge where the lagoons enter Marina Lake, at the boat landings (down the trails) on the Long Pond in the lagoons, all along Misery Bay (especially along the walls near Perry's Monument), and along the North Pier. There are handicap accessible fishing areas on both sides of the channel to Marina Lake. With the help of the S.O.N.S. of Lake Erie and the Erie-Western Pennsylvania Port Authority, access to the Bay along the south shore has been improving. The first access to the west is at the foot of Sommerheim Drive in Millcreek Township (just east of Peninsula Drive off West 6th Street). There is access, and an area to launch a car top boat, at the foot of the road to the east of the pump station. The first access to the west in the City of Erie is at Ferncliff. Drive to the foot of Ravine Drive (off Virginia Avenue) to the bottom of the hill. Just before the gate to the Erie Yacht Club, turn right. Park along the road. The next access is at the foot of Lincoln Avenue. Again drive north on Lincoln Avenue to the Bay. The road ends at Ravine Park. The land is owned by the Port Authority and leased to the homeowners. Park along the road and walk east to the Bay. The next access to the Bay is along the wetlands at the mouth of Cascade Creek. There is public parking for up to 50 cars in the paved parking lot off the Bayfront Highway just south of the Niagara Pier condominiums. Park just to the south of the small administration office. Walk over the wooden bridge, then north along Cascade Creek to the Bay. There are 17 acres of public land along Cascade Creek at its mouth. Cascade Creek is also stocked with trout during the regular trout season. It is stocked from its mouth, through Frontier Park, to just south of West 8th Street. Going east along the Bayfront Highway, the next access is along Pier 2, now the site of Perry's Landing Marina, and along Pier 3 (also known as the Liberty Street Dock). Parking is permitted in the area north of the Bayfront Highway and south of the piers. Access and fishing is permitted all along the east side of Pier 2 in Perry's Landing Marina, although access is not permitted on the wooden boat docks inside the marina. Access is also permitted along the area between Pier 2 and Pier 3, and along the entire west side and north end of the Liberty Street Dock. The area along Perry's Landing Marina and the Liberty Street Dock provides 4000 feet of public access for fishing and other recreational opportunities. These areas are open to the public from sun up to sun down. The next access is just east along the Bayfront Parkway at the Bay Harbor Marina (immediately east of Shakespier's restaurant). There is a five-foot wide walkway along the pier that is open to public fishing. There is also a public boat launch at the Bay Harbor Marina. Parking is again available between the Bayfront Parkway and the water. Just to the east, past the Commodore Perry Yacht Club, is the Cherry Street Marina. Although the marina is private, there is 1,500 feet of public access to the bay along the east and north walls of the Cherry Street Marina. 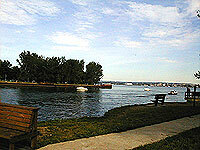 East of the Cherry Street Marina along the Bayfront Parkway is the Chestnut Street Park and boat launch. This park has been recently improved. There are four launch ramps, two on each side of the old boat house. The launches to the east are well protected. Larger boats can be launched from this site. Parking is available in the paved parking lot. Shore fishing is permitted from sun up to sun down along the breakwalls. Fishing is also permitted all along the west side and at the north end of the walkway just to the west of Water Authority building. The next pier to the east (just west of the Public Dock or Dobbin's Landing) is the Sassafras Street Dock (formerly known as the Erie Sand and Gravel Dock). Plans are being made to officially make the Sassafras Street Dock open to the public. Although not officially open, the dock can now be accessed for shore fishing. The entire area around Dobbin's Landing (formerly known as the Public Dock) is open to public fishing. This is located at the foot of State Street in the center of the City of Erie. This area has been recently improved. There is an 138 foot tall observation tower (known as the Bicentennial Tower), lighted walkways and benches. Fishing is permitted all the way to the west of the pier, all along the north end of the pier, and to the east end where the Rum Runners restaurant is located. Just to the east of Dobbin's Landing is the Holland Street Dock (also known as the Grain Elevator Dock and the Penelec Dock). The new Erie County Public Library is located here. The Maritime Museum and the home of the Brig Niagara are also located here. Although currently there is no public access along this dock, plans are being made to provide access. To the east of the Holland Street Dock is the Metro Machine Dock (formerly known as the Litton Dock). There is no access at the Metro Machine Dock. To the east of the Metro Machine Dock is the Coal Dock (also known as the Pulp Dock and the East Pier). Erie Sand and Gravel now occupies the Coal Dock. Public access is available only at the south end of the Coal Dock. The last dock to the east is the Parade Street Dock. The Parade Street Dock is a large, open area, but currently there is no public access at the Parade Street Dock. The Port of Erie Marine Terminal is located at the east end of the Bay, just inside the channel. The south pier and Lampe Marina are located here. There is good shore fishing all along the South Pier. To access the South Pier, turn off the Bayfront Parkway onto the Port Access Road and follow it north to the Bay. Turn right into the parking lot. Access is available all the way to the east end of the south pier. Ice fishing on the Bay is popular in the winter when there is sufficient ice. The Bay usually freezes in the winter. Often there is sufficient ice by December. The ice forms first at the head of the Bay. Ice also forms early in Horseshoe Pond and Misery Bay. The ice progresses toward the east and the channel as the winter wears on. Occasionally in the early Spring large freighters move out of the Metro Machine dock and break the ice as they move, causing unsafe ice conditions at the east end of the Bay. The most popular location for ice fishing is at the head of the Bay and in Misery Bay and Horseshoe Pond. Most anglers who ice fish the head of the Bay enter from Presque Isle State Park. Many park either in the Beach One parking lot, or in the first two parking lots along the Bay side of the park. Most ice fishing is for panfish, especially perch. Popular methods are to use a tip-up or a small ice fishing pole. Minnows, grubs and small jigs are popular. Some anglers will target northern pike while ice fishing. Common baits for pike are large minnows or small suckers. Occasionally a surprised angler will hook a steelhead through the ice. Many anglers use some type of ice hut to break the bitter cold of the wind whipping across the frozen Bay. Perch are a popular fish in the Bay. There is a minimum size for perch during ice fishing season, and during this time many perch caught in the Bay are below the size limit and must be immediately returned to the water unharmed. For further information, see the Regulations page. The Bay also supports numerous other panfish, including sunfish, bluegills, rock bass, white crappie and black crappie. Panfish are caught in the Bay by the usual methods. Jigging, casting with small lures and still fishing with minnows are popular methods. Panfish can be caught almost anywhere in the Bay. On the park side, Misery Bay, Horseshoe Pond and the North Pier are popular in the summer. On the City side, the foot of Sommerheim Drive (now typically closed to access), the piers along the Bayfront Parkway, the Dobbin's Landing area and the South Pier are all popular. As explained in the Lake page, much of the fishing for smallmouth bass is in Lake Erie. 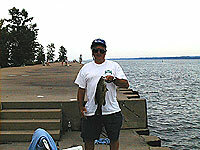 However, the Bay holds very good numbers of both largemouth bass and smallmouth bass. Like Lake Erie, the Bay is now designated a "big bass" water. Until mid-June, only one smallmouth or largemouth bass may taken, and it must be over 20 inches. This regulation is designed to allow the bass to get through the spawning season with minimal fishing pressure. Once this early season is over, the current size limit for bass is still 15 inches. For further information, see the Regulations page. Many bass that are caught are under the size limit and must be immediately returned to the Bay unharmed. Bass are taken both from shore and from boats. Popular spots for boat anglers include Misery Bay, Marina Lake, Horseshoe Pond and the area from Perry's Monument to the channel. The north shore of the Bay, along the weed beds, from the head of the Bay to just east of the Administration Building, are popular both for boat fishing, and for wade-in fishing for bass. Most bass fishing in the Bay is done by casting common bass lures, including crank baits, surface lures, plastic worms, twisters, bladed spoons, and nightcrawlers on small spinner harnesses. Summer and fall are the most popular times for bass fishing. Presque Isle Bay supports a very good northern pike fishery. Pike are harvested from the Bay (usually from Misery Bay or the lagoons) and milked for stocking in other parts of the Commonwealth. Although Misery Bay is the most popular location for northern pike fishing, they may be taken just about anywhere in the Bay. The most popular time for fishing for northern pike is in the spring. Muskellunge are also taken in the Bay, although the number of hardy anglers targeting these monsters seems to be dwindling. The minimum size for muskies has been raised to 40 inches. See the Regulations page for details. Muskies can be found throughout the Bay. Most anglers targeting these fish troll through the Bay, using a very stiff rod and very heavy line, pulling a chub plug or a large spinner. Muskie anglers log many hours between fish. The popular time for fishing for muskies is in the late fall, particularly on cool and overcast days. As described in more detail in the Stream Fishing page, Lake Erie holds steelhead, salmon and brown trout, and steelhead are by far the most predominate. However, none of these salmonoids is taken with regularity in the Bay. Occasionally steelhead will be taken in Horseshoe Pond or from Dobbins Landing. The vast majority of walleye fishing in the region is done on Lake Erie, and not in the Bay. For a description of fishing in the Lake, see the Lake Fishing page. As explained on that page, there is some shore fishing for walleye in the spring, especially along Dobbin's Landing. Anglers also troll for walleye along the southwest side of the Bay, near the Perry's Landing Marina and the Liberty Street Dock area. Walleye are very rarely caught through the ice.